PRICE REDUCTION! Welcome home to this beautifully landscaped private, tropical paradise! Morning, noon or night, this will be a memory making oasis offering the best of Southern California outdoor living for your family. Cool ocean breezes and beautiful sunsets make this cozy two story, 3 bd, 2 1/2 ba., home a real gem in the highly desirable "Summit" of Carlsbad. Bonus room off Master could be office, nursery, customized. No HOA’s or Mello Roos! 5 min. to dining, shopping, schools, and beaches! Plenty of family living space downstairs. Upgraded bathrooms, fresh paint, spacious vaulted ceilings, and new furnace. Sellers invested in this gorgeous yard to make it comfortable for entertainment, kids parties, and full family enjoyment, while leaving room for a pool or granny flat. Close to Legoland, Carlsbad flower fields, beaches! This property is ready for a new family to bring their special touches and make it home. Sprawling across 2+ acres this stunning European style hilltop estate features a magnificent single level home w/300 degree panoramic views from Mexico to Cowles Mt. This 6BR, 6.5BA, 5,970 esf. incredible home including detach guest suite offers a unique & luxurious style that is second to none. Designed for entertaining, the home includes a grand entry, stunning courtyard w/pool, spa & outdoor kitchen, great room w/chef's kitchen & full bar, dining room w/wine cellar, organic garden, 5 car garage & more. Located only 15 minutes from downtown San Diego on 2+ acres, this beautiful European inspired estate offers a designer-quality interior, panoramic views and a resort-style central courtyard. Surrounded by lush tropical landscaping, the home features an impressive entry with two story ceilings, an elegant formal dining room with an adjacent wine cellar, a walk-behind wet bar and a stylish gourmet kitchen with commercial grade appliances. The home is oriented around a lavish center courtyard with a pool and spa and loggia with a fireplace. The estate has a gorgeous, light-filled interior with approximately 6,000 square feet and all the features that are essential to support a busy lifestyle. An artful blend of classic period details and modern amenities, this elegant home has arched doorways, walnut hardwood floors, wrought-iron details and an extensive use of beautiful, intricate Spanish tile. Peaceful mountain views provide a backdrop for the family room, but the spacious designer kitchen takes center stage, as it offers two large center islands, marble counters and an oversized built-in refrigerator. Separated from the family room by a breakfast bar, the kitchen also features dual sinks, two dishwashers, and a Wolf gas range with pot filler. Large secondary bedrooms and an extravagant master suite with open beamed ceilings add to the appeal. Reminiscent of a five star resort, the master bath offers stone floors and custom cabinetry, an artist-inspired backsplash and a modern, free standing tub set underneath a chandelier and a large picture window. Further highlights of this distinctive estate include a private motor court, solar panels, organic garden, lush fruit tress, detached guest suite and a five car garage featuring extra storage. With a highly secluded, picturesque setting on a sprawling hilltop plot with meticulous landscaping, this home is minutes away yet worlds apart. Situated at the top of a bluff, this incredible and exclusive estate property with private tennis court is located on nearly 1.5 acres in the gated community of Rancho Glens Estates! Built in 2000, this single story Tuscan styled home is very open & bright. Centered on the pool and spa and overlooking a canyon there are expansive views throughout! Wood double doors lead to the master retreat featuring dual sided granite fireplace between sitting area and stunning master bath/spa. Brand new carpet & paint! Situated at the top of a bluff, this incredible and exclusive estate property with private tennis court is located on nearly 1.5 acres in the gated community of Rancho Glens Estates! Built in 2000, this single story Tuscan styled home is very open and bright with sun entering from all angles throughout the day. Centered on the pool and spa and overlooking a canyon there are expansive views throughout! Wood double doors lead to the master retreat featuring dual sided granite fireplace between sitting area and stunning master bath/spa. Built-ins in office and living room. Covered patio features outdoor kitchen with fire place! On site Propane tank. Freshly painted and all carpeting is brand new Mohawk sculptured touch! This home is ready for a new family! Gorgeous Family home in highly desirable Scripps Ranch-Stonebridge Estates! Beautiful mountain views throughout. This home is an entertainers dream! California indoor-outdoor living. Solar included (owned). Gourmet kitchen w/granite counters, SS appliances & large island. Many room options 5 large bedrooms, spacious loft, PLUS 2 bonus rooms currently used as an office & music room. A convenient downstairs bedroom w/full bath. The MB features panoramic mountain views from the oversized balcony. See Supp. The office and music rooms are located conveniently downstairs. A high vaulted ceiling in the living area enhances its spacious look. The combined casual dining room, living area and kitchen space makes up the largest room in the home. Gorgeous wood flooring. This home is pre-wired for speakers. Tankless water heater, If you are looking for a spacious home and a large yard this is it! You will appreciate the Boundless outdoor space which offers plenty of play space for kids, build your dream pool or add another room. The backyard features a wide variety of fruit trees, sunken fire pit with plenty of seating and covered patio area with fireplace. Close to top ranked Poway schools! Extensively & tastefully remodeled in the last couple of months! This beautiful 3562 sqft spacious Autumn Ridge home is on more than 1/4 acre lot, in a quiet cul-de-sac in Scripps Ranch, built in 1996, offering 6BR + library/office, 4BA. 1BR & 1BA and also the den/library are downstairs. Resort-like backyard w/ pool, spa, fire pit, built-in BBQ, large grassy area, covered patio and lush landscaping. Close to shopping, restaurants, farmer’s market, A+ rated schools & freeways. See below for more details… Welcome to the house of entertainer’s dream. The beautiful and the extensive recent remodel & upgrades just completed after a few months. Some of the highlights are the light color paint throughout including the doors and ceilings, hardwood floors, matching stained handrails on the steps and also all cabinets in the kitchen and baths, new sinks, new tall baseboards, Epoxy garage floors, LED lights, refinishing the entrance door and so much more... The resort-like backyard offers beautiful pool & spa, built-in BBQ, fire pit, covered patio & large grassy area. Pool/spa plumbed for solar panels. The downstairs features a bedroom with full bath, a den/library, a formal living/dining, an inviting family room with fireplace adjacent to the kitchen. The beautiful kitchen features upgraded cabinets, GE profile appliances, granite slab counters, a central island, dual ovens, 5 burner gas cook-top stove, microwave, a walk-in pantry alongside an informal eating area. Beautiful travertine and hard wood floors are tastefully combined. Upstairs, in addition to the master suite, there are 4 bedrooms (one is an en-suite). There are 2 Jack-n-Jill sink areas attached to the full bath. The spacious master bedroom/bathroom suite with many upgrades. Other indoor features include security system, ceiling fans, recessed lighting, dual A/C units, crown molding, upgraded baseboards, neutral paint with design touches, an indoor laundry area with sink & storage. 3 car garages. Close to ALL! THIS MAGNIFICENT HOME IS A FORMER MODEL & HAS UPGRADES GALORE W/CUSTOM DESIGN WOOD FLOORINGS THROUGHOUT! SINGLE-STORY MASTERPIECE HAS A PRIVATE GATED ENTRANCE TO AN ELEGANT COURTYARD W/WATER FOUNTAINS THAT LEADS TO A FORMAL DINING, FAMILY AND LIVING ROOMS. ENORMOUS GOURMET GRANITE KITCHEN & MATCHING ISLAND W/ S.S. APPL. MASTER RETREAT & JACCUZZI TUB. OPEN FLOOR PLANS & WELCOMING BACKYARD WITH BRICK FIREPLACE SURROUNDED BY NATURE. ENTERTAINER’S DREAM HOME WITH A DESIGNER'S TOUCH! (SEE SUPPLEMENT BELOW) The Gem of Vezelay Is Now For Sale! This Former Model Has Upgrades Galore w/Custom Design Wood Floorings Throughout! Single-Story Masterpiece Has a Private Gated Entrance to an Elegant Courtyard with The Soothing Sounds of Water Fountains Surrounded By 3 French Doors That Opens to a Large Formal Dining, Family and Living Room That Leads to an Enormous Gourmet Kitchen with Granite Countertops & Backsplash & Matching Island. S.S.GE Monogram Appl. w/Wine Cooler, Refrigerator,6-Burner Gas Stove, 2 Dishwashers, Dual Ovens, Warming Drawers, Microwave,Reverse Osmosis, Large Walk-in Pantry & Breakfast Nook Area Overlooking the Lushes Landscaping. Formal Dining Room Has Custom Wood Ceilings. Huge Family Room w/Brick Gas Fireplace & Custom Entertainment Center w/Built-In Surround Sounds, 12 Foot Vaulted Ceilings, Designer Paint, Crown Molding, A/C & Dual Pane Windows w/Wood Shutters & Plenty of Natural Lighting. Spacious Master Retreat w/Marble Fireplace, Walk-In Closets & Spa Bathroom w/ Marble Jacuzzi & Shower & Dual Vanities. 2 Large Bedrooms each has its Own Full Bath & Mirror Closets & Just to the Right of the Foyer Has a Custom Built-In Office w/Desk & Shelves. Welcoming Backyard Features a Covered Patio area w/Speakers & Private Outdoor Brick Fireplace Perfect for Entertaining Surrounded by Manicured Lawn all in a Secluded Setting. Indoor Laundry w/Sink next to a 3 Car-Garage w/Brick Driveway & so Much More! Poway School District with Nearby Wineries, Golf, Restaurants, Shopping. This Exceptional Gated Property is Located in a Private Cul-De-Sac and is Truly an Entertainer’s Dream Home with a Designer’s Touch! THIS IS A MUST SEE! * JUST LISTED * See the 3-D TOUR * Unobstructed Panoramic Views! This exquisite custom home built in 2009 will enchant you from the moment you enter the driveway. No expense was spared with this fabulous home in Lomas Serenas. From the entry doors, hardwood floors, soaring ceilings, numerous picture windows, to the expansive gourmet kitchen, this bright and open energy efficient home was built to entertain. You'll enjoy entertaining friends and family in the amazing backyard ** SEE SUPPLEMENTAL REMARKS ** You'll enjoy entertaining friends and family in the amazing backyard featuring a built-in outdoor BBQ with sink and refrigerator, covered patio, and a private sandy beach area with a sparkling solar heated salt water pool, and outdoor shower. Additionally the beautifully designed landscaping with a variety of plants and flowers, there are covered seating areas and 2 fire-rings to enjoy the outdoors year-round. The home features a main level master suite with a spacious walk-in closet, and master bath with a soaking tub, dual vanities, and spacious separate shower. There's also a guest room and bath on the main level, along with a dedicated office/library with custom built-in desk and shelving. Upstairs features 3 bedrooms, 2 full baths, a study area with built in desk, walkway overlooking the great room, along with a large balcony off one of the bedrooms with fantastic panoramic views. Rare to find a newer custom home with no Mello Roos! This is a one of a kind family home in the sought after community of Lomas Serenas! Great location with great shopping and dining nearby, and quick access to the I-15 and the dedicated entrance to the HOV commuter lane, too! Bright, Light, Renewed and Priced To Sell! Open floor plan with serene, dramatic feel. Impressive rotunda entry, volume ceilings, crown molding, striking ironwork railings and wood paneled library loft. The gourmet kitchen opens to the family room and features a large food preparation island, handsome cabinetry, stainless steel appliances, built-in refrigerator, built-in desk, and family-sized pantry. Sited in the desirable Mar Fiore community in Aviara. Minutes to the beach & freeway Authentic Early California architecture representing the style of Old Santa Barbara.” Private, gated entry courtyard. The lavish master suite: generous walk-in closet, dual sinks, vanity, oval tub, and separate enclosed shower. The Property backs to open space with beautiful eucalyptus trees. Situated within award winning school districts, shopping, 5 star hotels, world renowned beaches, & famous hiking trails you do not want to miss everything this home offers! JUST REMODELED! STUNNING EXECUTIVE HOME ON A ¼ ACRE LOT HAS EVERYTHING YOU ARE LOOKING FOR W/AMAZING OPEN FLOOR PLAN & UPGRADES GALORE! GOURMET KITCHEN W/GORGEOUS GRANITE COUNTER TOPS & WET-BAR W/STAINLESS STEEL APPLIANCES. ENORMOUS LIVING ROOM W/ BEAUTIFUL WOOD BEAMS & SKYLIGHTS THAT LEADS TO THE FORMAL DINING ROOM OVERLOOKING THE PARK-LIKE BACKYARD. SPACIOUS FAMILY ROOM HAS FIREPLACE & 1 BEDROOM ON 1ST FLOOR SURROUNDED BY VINYL WOOD FLOORINGS. LARGE MASTER SUITE & SO MUCH MORE! SEE SUPPLEMENT BELOW Huge Gourmet Kitchen with Gorgeous Granite Counter Tops and Matching Wet-Bar. New Stainless Steel Fridge, Dual Ovens, Dishwasher, Glass Cook Top with Vent and High-End Cabinets & Tons of Storage Space. Enormous Living Room with Beautiful Wood Beams, Skylights, Vaulted Ceilings and Plenty of Natural Lighting that Leads to the Formal Dining Room Overlooking the Park-Like Private Backyard. Spacious Family Room has Marble Gas Fireplace and One Bedroom on the 1st Floor with Built-Ins shelves and has separate laundry room All Surrounded by Vinyl Wood Floorings, Plantation Shutters & Curtains, Recessed Lightings, A/C and Designer Paint Throughout! Giant Master Retreat with New Plush Carpeting & padding, Mirror Walk-In Closets and Large Master Bathroom with Granite Counter Tops, Soaking Tub, Dual Sinks & Custom Cabinets. All Bedrooms Are Very Spacious. Enjoy the Peaceful Backyard Surrounded by Professional Landscaping, Auto Sprinkler & drainage System that is Perfect for Entertaining and Large Enough for a Pool! 3 Car Garage with plenty of parking space in Driveway! This home is about 3.5 miles from the beach and encompasses a small town feel & beach community with character and unification. The La Costa neighborhood in the city of Carlsbad which offers lots of open space and natural environment with access to trails accompanied by recreational active & healthy lifestyles and is close to Omni La Costa Resort, Aviara, Legoland and numerous shopping & dining areas. 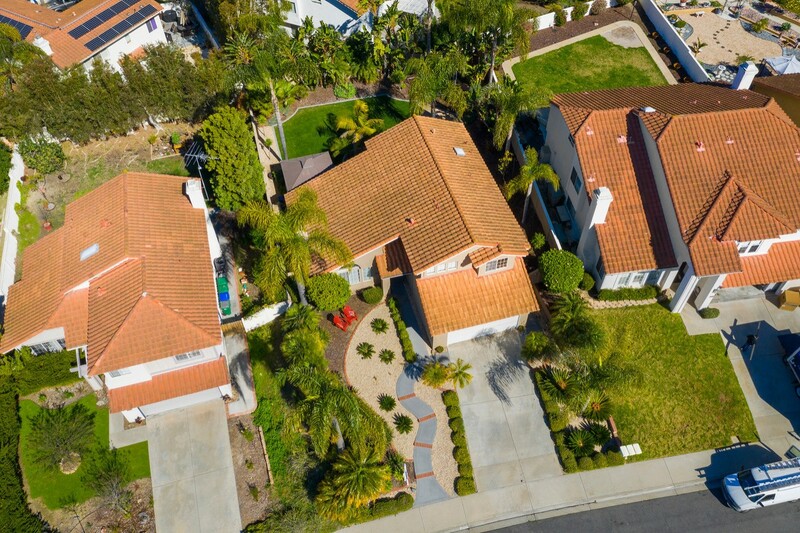 Located in the desirable Carlsbad Unified School District with the nearest schools are La Costa Heights Elementary & La Costa Canyon High School. Best of all NO HOA OR MELLO ROOS! 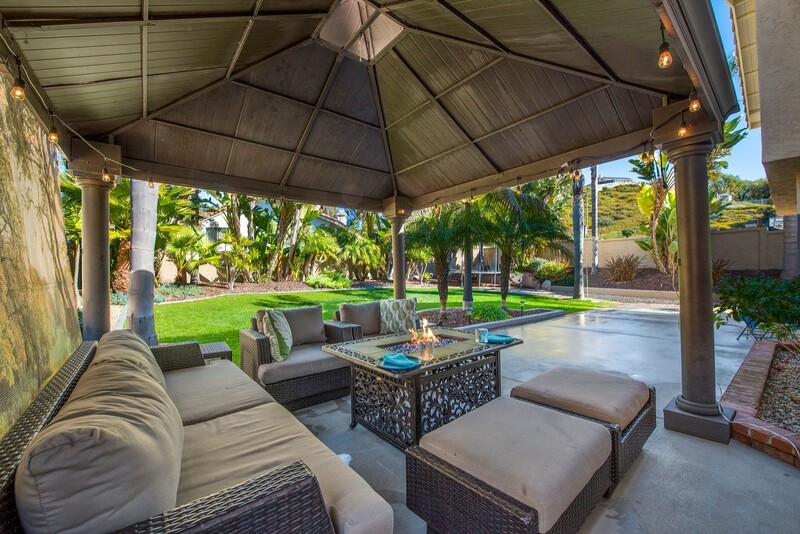 Coastal Resort Living in Carlsbad. 4+ Bedrooms. Private courtyard entry. Rich wood floors. Gourmet kitchen feature huge center island and tons-o-storage. Adjacent family room with fireplace. Dramatic vaulted ceiling Dinning Room with french doors. Private master suite with spa tub, huge walk in closet. Office on first floor, bonus room upstairs. Rear yard features large spa, water feature, and dining area. Energy efficient - 2 zone A/C, Solar, tankless water heater. Resort like community "Swin Club" features large pool & kid's pool, jacuzzi, BBQ's, tennis and more. Walk to Sage Creek High School. Beach close. EZ access to shopping, dining, LegoLand, Outlet Mall and everything you need. 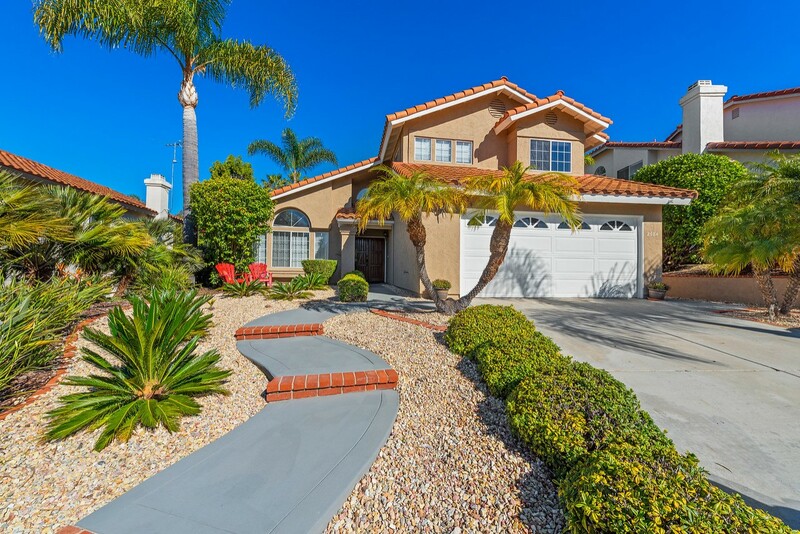 All offers will be considered for this beautiful three bedroom, 3 bath, Mediterranean home nestled between San Clemente and Dana Point, above Coast Hwy in Capistrano Beach! Freshly painted and gorgeous upgraded baths, with a highly desirable bedroom and full bath downstairs! Master suite has adjoining studio/office space with two outdoor decks. Welcome home to this quiet, cul-de-sac location with no HOA's or Mello-Roos, within walking distance to parks, beach, shopping, and dining! Home freshly painted, stone flooring throughout downstairs, with guest bedroom that has French doors that open to a garden patio, bathroom has custom iridescent glass tile shower, with hand blown glass vessel sink. Upstairs has dark solid wood flooring throughout, master bath has custom inlaid wood and marble flooring, stone shower, his and hers pedestal vanities, oversized tub, and is spacious in size. Kids bathroom has custom pebble flooring and paint. Sellers expected to renovate kitchen next, and build granny flat, but have decided it won’t be enough room. Absolutely fabulous location and opportunity to add equity here! Bring your kitchen and landscaping ideas to finish a fabulous home! Stylish & spacious home where contemporary meets old world charm. Built in 1945 this home represents the best of Mt. Helix. Entry level has a grand living room with fireplace, open beam ceilings, hardwood floors and patio for indoor/outdoor living, a stunning kitchen w/ panoramic views, and formal dining room. Downstairs is an enormous living area, fireplace, office and master suite. Magnificent grounds w/ mature trees and many stone walking paths, patios & arches. Large lot fully enclosed and private. This home has stunning architecture, beautiful grounds & privacy. Many wonderful touches including custom lighting, built-ins and brick wall. Large lot which is fully enclosed by a gorgeous stone and wrought iron wall. The stonework is carried over into the many patios with arches and curves. Walking paths take you to the large grass area for the kids to play. This sprawling 4922 square foot home could easily be used as a multi-generational dwelling. Mt. Helix is approximately 15 minutes to downtown San Diego in La Mesa. The famous Mt. Helix Park and cross are close to the property and boasts panoramic views to the ocean, theater performances, yoga, and other community events. The Mt. Helix cross can be seen from the kitchen window. There are also many popular restaurants and shops nearby including The Brigantine and the trendy La Mesa Village. Close to several shopping malls and near the freeway for easy commute with no freeway noise. MAGNIFICENT HOME HAS EVERYTHING YOU ARE LOOKING FOR WITH TONE OF UPGRADES! HUGE GOURMET KITCHEN GRANITE COUNTERTOP & ISLAND, NEWER APPL, STAINED GLASS WINDOWS. FORMAL DINING, LARGE LIVING/FAMILY ROOM W/BAR & FIREPLACE SURROUNDED BY GORGEOUS WOOD FLOORINGS, WOOD TRIMS, DECORATIVE NATURAL STONE & DESIGNER PAINT THROUGHOUT! HUGE MASTER SUITE & SPACIOUS BEDROOMS & MONEY SAVING PAID SOLAR PANELS! RESORT LIVING W/OVER $70,000 IN POOL & WATERFALL, BUILT-IN BAR, BARBECUE & CUSTOM PALAPA! (SEE SUPPLEMENT BELOW) THE GEM OF LA MERIDA IS NOW FOR SALE! THIS MAGNIFICENT 4 BEDROOM & 2.5 BATHS HOME HAS EVERYTHING YOU ARE LOOKING FOR WITH OVER $60K IN UPGRADES JUST INSIDE! HUGE GOURMET KITCHEN WITH GRANITE COUNTERTOP AND CUSTOM WOOD ISLAND WITH GAS STOVE, NEWER APPLIANCES, TONS OF CABINETS AND STAINED GLASS WINDOWS. SPACIOUS FORMAL DINING ROOM WITH CHANDELIER AND LARGE LIVING & FAMILY ROOM WITH BAR & FIREPLACE SURROUNDED BY GORGEOUS WOOD FLOORINGS, CUSTOM WOOD TRIM, BEAUTIFUL WINDOW COVERINGS, HIGH CEILINGS, DECORATIVE NATURAL STONE DESIGN AND DESIGNER PAINT THROUGHOUT! HUGE MASTER SUITE WITH WALK-IN CLOSET AND MASTER BATH HAS SEPARATE SHOWER & BATH TUB AND DUAL SINKS. SPACIOUS BEDROOMS WITH PLENTY OF NATURAL LIGHTING. MONEY SAVING SOLAR THAT IS PAID FOR! RESORT LIVING AT IT’S BEST WITH OVER $70,000 IN ENHANCEMENTS WITH BEAUTIFULLY CARVED TROPICAL FOLIAGE ON WATER CONSERVING DRIP SYSTEM, SOLAR, FULLY AUTOMATED POOL EQUIPMENT, ARTIFICIAL ROCK POOL WITH WATERFALL, BUILT-IN BAR, BARBECUE AND CUSTOM PALAPA! ALL IN A QUIET CUL-DE-SAC CLOSE TO SCHOOLS & SHOPPING. THIS A MUST SEE! Resort living at its best in Scripps Ranch. This stunning highly upgraded home offers seamless indoor/outdoor living. Seller spared no expense when upgrading this beautiful home. Including a gourmet kitchen w/California French Cabinets, granite counters, Heirloom black walnut island & upgraded SS appliances. New A/C. Brazilian Rosewood Hardwood floors. Upgraded bathrooms, plus new steam shower. Plantation shutters. Gorgeous yard w/pool/spa & professional landscaping. Close to top ranked schools. NO HOA! Spacious Master bedroom w/bamboo flooring, upgraded bath, sky lights & dual closets. The manicured grounds of this home are so impressive with the lush & colorful landscape. The private resort-style backyard is ideal for entertaining with an oversized pool/spa, the lush & tropical trees and plants that surround the property. Close to top schools, shopping and parks. NO HOA or Mello-Roos, Do not Miss! 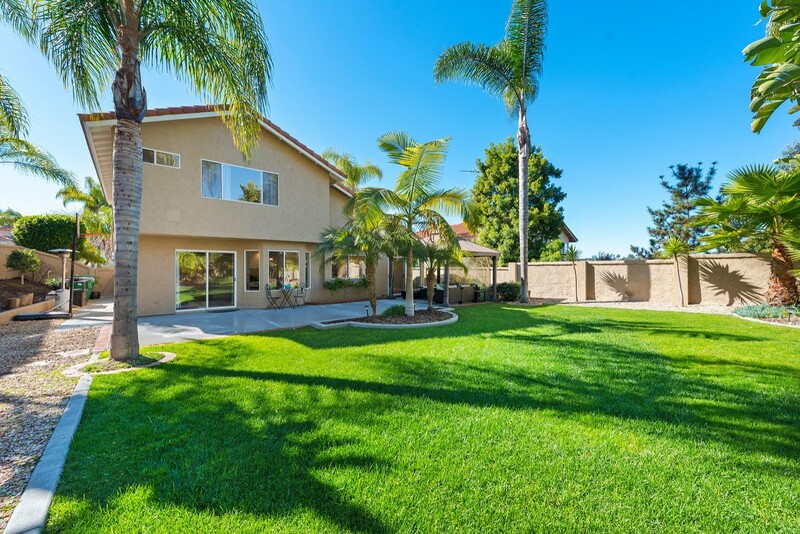 Very spacious 4 bed and 2 1/2 ba home is at the end of a very private cut de sac in a highly desirable Rancho Verde in SW Escondido, with no HOA. Features include a well designed and open floor plan, high vaulted ceilings, a granny type extension flat of bedroom 2 with a covered patio/deck to the back yard and an extra-large private backyard overlooking the water fall. This can be used as In-law Suite, Nanny’s quarters or??? Completely painted inside & out. 3 car gar. Loads of storage. See add. for more. Prime Location with a large flat lot, pool and panoramic views on a quiet cul de sac. Double door entry, soaring cathedral ceilings, two fireplaces. Light streams in through windows and skylights. Master suite and guest suite are near the entry while the other three bedrooms are down the hallway. Kitchen and family room lead onto the patio & outdoor oasis with many fruit trees and room to roam. 3 car attached garage. Privacy is paramount here on this elevated 21,377 sq ft lot. Solar is leased. PUSD. Gorgeous View Home! Located in Highly desirable Scripps Ranch. 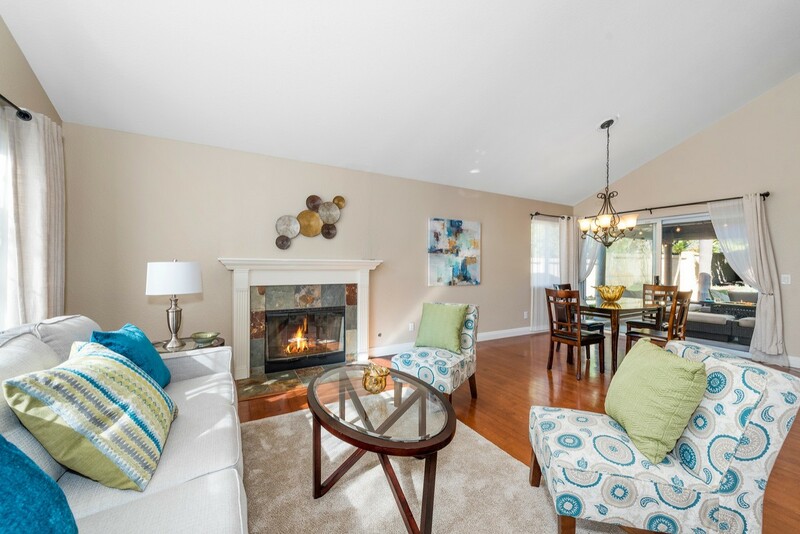 Perfect Tri-Level family home w/light-bright open floorplan w/vaulted ceilings. Upgraded tile flooring. Gourmet kitchen w/quartz counters & breakfast nook. Family room w/gas fireplace. Dual paned windows. A/C. Spacious Master bedroom located downstairs w/walk-in closet and upgraded bath. Oversized 3 car garage. Entertainers private dream backyard w/mountain and canyon views. Newer Trex deck. Close to top ranked schools. NO HOA or MELLO-ROOS! VRM $799,900 to $809,900 - Priced Below Appraisal! Breathtaking Unobstructed Panoramic Views. Bernardo Heights single level home with a fully remodeled kitchen featuring granite countertops & stainless steel gas range, microwave, & dishwasher, all new cabinets with soft-close drawers & lots pull out shelving. Spacious living room & formal dining room, with a bonus room that features a huge picture window to take in the spectacular views. Situated on a quiet cul-de-sac, this is the very best location! The home is very private, and set up on a hill with a green space between the neighbors behind the property. The master suite features vaulted ceilings, ceiling fan, and French doors onto the patio. The master bath has a dual vanity, recently updated shower, and adjoins the walk-in closet. Enjoy the outdoors on the private patio, enjoy a cup of coffee at sunrise, and a glass of wine at sunset. The low-maintenance yard has rose bushes, a succulent garden, and some Lemon and Orange Trees! Located in the community of Bernardo Heights, there's no Mello Roos, and a small HOA fee which gives you access to 2 swimming pools, 8 tennis courts, 2 club houses, a work-out facility, pool table, activity rooms, community activities, Lucido Park with jogging/walking trail, tennis courts, and playground & much more! Close to Sprouts, dining, schools, and the Bernardo Heights Country Club. And it's located in highly rated Poway Unified School District! This community has it all! Once in a Lifetime Opportunity! Situated high above Lake Hodges, you can Build your Dream Home with this unobstructed Panoramic Views. Featuring Over 5 Acres of land which is adjacent to City owned property on 2 sides, protecting the views. Located in the quiet community of Rancho San Bernardo, just minutes to I-15, this location is surrounded by multi-million dollar homes and is an ideal location for an architectural masterpiece. Don't miss out on this fabulous piece of nature. Your own private retreat,perched on a hill with a view of the valley.Kitchen offers granite counter tops,an island and stainless steel appliances.Very spacious living room with cozy fireplace,and area for dining.Large master bedroom and bathroom privately secluded on one end of the home with 2 roomy closets.Beautiful outdoor living space with plenty of room for entertaining poolside!Located approx 1/4 mile from Greenfield Dr and zoned for you to have your horses on the property.Room for all your toys! Fabulous updated, upgraded, light and bright home on quiet cul-de-sac street in highly desirable North Clairemont neighborhood. Enter via secure entry through speakeasy door into private atrium. The kitchen, boasting quartz counters and a pantry, is open, light and bright affording the chef to feel part of gatherings and close to dining areas. High ceilings in the living area and master bedroom give spacious feel. All bedrooms have ceiling fans and other than master all have solar tubes for natural light The back yard is perfect for the entertainer with a covered patio a separate deck area with gas fire pit plus a BBQ area. The mounted TV with soundbar under the covered patio is great for outside social gatherings. This home is a single story, open floor plan home located on quiet, cul-de-sac street, located close to parks, schools, shopping, transit, and freeways. Updates and upgrades include:- Double pane windows throughout. Solar tubes/skylights. Upgraded electrical subpanel. Solar system - paid in full. 2017 furnace & A/C. Recessed lighting. Doors, door casing, baseboards. Flooring. Deck drainage - 17 deck drains, channeled to street. textured concrete. natural gas fire pit and BBQ. Future connections for outdoor hot tub (electrical and water). Seller is entertaining offers between $699,900-719,900. Enjoy NO MELLO ROOS and very low HOA for this Rolling Hills Ranch beauty! Owners have access to FIVE surrounding community pools. Full bedroom and bathroom located downstairs and optional 5th bedroom upstairs. Highly Rated K-12 schools! Located 1 block from the San Carlos Rec Center & Community Garden and minutes from 3 well rated Public Schools, this renovated home features: Seller Owned Solar Panels, Upgraded 200 Amp Electrical Panel, great HVAC System w/Nest Thermostat, Energy Efficient Dual Pane Windows & Sliding Glass Doors, New Paint & Custom Window Treatments, Ring Doorbell, Seller owned Security System, Chef’s Kitchen, w/White Kitchen Cabinets, Quartzite Counters, Stainless Apps, 552 sqft Living & Family Rm, etc. A MUST SEE! (1.) Seller Owned Solar Panels, (2.) Upgraded 200 Amp Electrical Panel, (3.) New Rain Gutters around Home, (4.) Great Central Heating & Air Conditioning Unit, (5.) Energy Efficient Dual Pane Windows & Sliding Glass Doors throughout Home, (6.) New Paint throughout Home, (7.) New Custom Window Treatments throughout Home, (8.) Beautiful Hickory Flooring throughout Home, (9.) Nest HVAC Thermostat, (10.) Ring Exterior Security Doorbell, (11.) ADT Security System (Seller owns Equipment), (12.) Minka Lite Wave Wireless Remote Ceiling Fans, (13.) Restoration Hardware Dining Room Light, (14.) New Bar Light with a new Electrical Switch, (15.) Newly added Electrical Outlets in Backyard, (16.) New Hose Bib & Sump Pump in Backyard, (17.) Large Entertainers Floor Plan, with the Kitchen opening up onto both a 253 square foot Living Room and a 299 square foot Family Room, (18.) 180 square foot Chef’s Kitchen, with White Kitchen Cabinets, Quartzite Countertops, designer Tile Backsplash, Stainless Steel Appliances, new Range Hood, new Kitchen Faucet, new Refrigerator & recessed Lighting throughout (all Kitchen Appliances being sold with Home), (19.) Spacious 226 square foot Master Bedroom with large Closets, a large attached Master Bathroom and new Glass panel, on the Master Bathroom Shower, (20.) Offers a space for Laundry in the Garage, with plenty of room for a Side-By-Side Washer & Dryer (Washer & Dryer are NOT being sold with Home), (21.) Offers Sod & tropical Landscaping in the Frontyard, offers Sod, tropical Landscaping & Fruit Trees in the Backyard (Everything is on an automatic Sprinkler System & Timer) & a great Pergola in the Backyard off the Family Room, perfect for entertaining, (22.) Offers a great 2 Car attached Garage with a new Garage Door & offers parking for 2 Cars in the Driveway, (23.) One block from the San Carlos Recreational Center and the San Carlos Community Gardens, (24.) Minutes from Lake Murray, Cowles Mountain, Shopping, Dining, the 125 and 8 Freeways. A MUST SEE! Beautiful New Construction on 8.9 Acres * Breathtaking Panoramic views. Single Level 3 Bed 2 1/2 Bath & 3 Car Garage. Spacious open floor plan features soaring 12 foot ceilings in the Kitchen & Great Rooms. Amazing Gourmet Kitchen with stainless steel appliances. Master Suite with huge shower, soaking tub, dual vanities, and a walk-in closet! whole house A/C, Tank-less Hot Water. Plenty of space for pool, casita, R/V Parking, Horses, etc. * 2+ Acres of Usable space AND Views! Large lot with plenty of usable space. Ideal of space for pool, casita, R/V Parking, Horses and more. * BUYER PLEASE NOTE * MLS Photos are of a previously constructed model home and include optional upgrades. Charming light and bright end unit townhome in one of the most highly desirable areas of North PB, located in a gated community on a quiet street. This townhome offers an open floor plan with two ensuite bedrooms, one with beautiful ocean views. Other fabulous features are cathedral ceilings, tile surround fireplace, skylights, greenhouse windows, and spacious 2-car garage. Put your personal touch on this wonderful townhome and make it your own! Close to the beach, shopping, restaurants and the 5 frwy. Charming light and bright end unit townhome in one of the most highly desirable areas of North PB, located in a gated community on a quiet street. This townhome offers an open floor plan with two ensuite bedrooms, one with beautiful ocean views. Other fabulous features are cathedral ceilings, tile surround fireplace, skylights, greenhouse windows, and spacious 2-car garage. Put your personal touch on this wonderful townhome and make it your own! Close to the beach, shopping, restaurants and the 5 frwy. Gorgeous, corner lot in Clairemont! Immaculately maintained & elegantly remodeled. Bright, natural light everywhere! 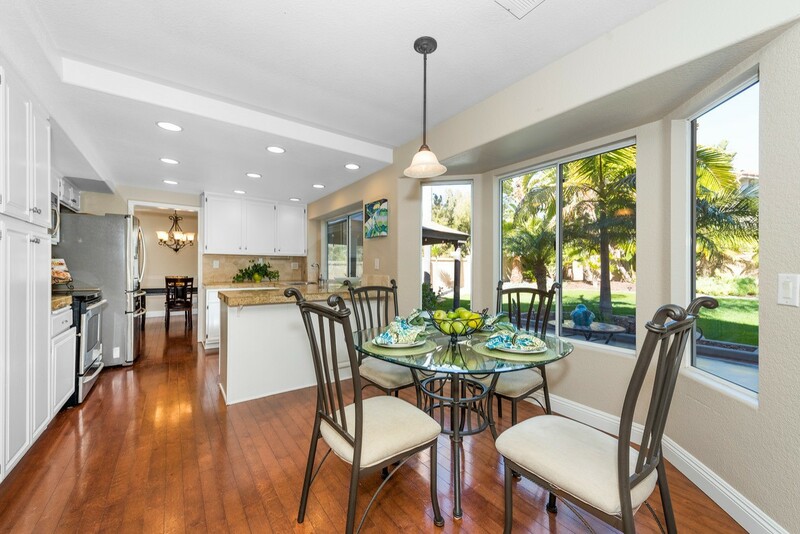 Entertain guests in your stunning, updated kitchen that flows easily into the dining room & living room giving way for a lovely open floor plan. Cozy up to your fireplace or relax out on your covered patio overlooking the private, beautifully landscaped back yard. Tucked away in a wonderful Clairemont neighborhood, this home has convenient access to great shopping & restaurants! The roof is a light weight concrete tile!! Endless views from nearly every room. Privacy and seclusion are yours at this gorgeous hilltop home nestled in the trees on 11 plus acres yet only a 5 minute drive to the freeway. Kitchen remodeled with granite counters, white cabinetry, stainless appliances, and stone look tile. Baths have been updated too. Generous sized rooms. Extra room is an enclosed spa room off the master suite with huge wrap around windows to enjoy the views while soaking in the bubbling hot tub. Tangerine, lemon and avocado trees Do not use GPS to this property! Follow these directions: 1-15 to Deer Springs exit, Left turn on Mesa Rock Rd, follow Mesa Rock Rd PAST the Belle Marie Winery to Windsong Lane, turn right on Windsong Lane, follow Windsong Lane about 0.1 mile to the private road on the left side off of Windsong Lane. Look for stake sign here with a directional arrow. Turn left onto the private road and follow 0.3 to 0.4 mile to a shared drive on the right hand side. There is another stake sign with a directional arrow marking this turn. Turn right but stay to the left and follow the road all the way to the end to the chain link fencing with the Henry's Avocado management gates. The driveway to 1232 is on your right. There is an electric gate at the driveway. DO NOT try to push open the gate. You must use the beige key pad and enter the code. PLEASE, PLEASE, remember to close the gate behind when you are finished. Thank you. This terrific Mount Street gem is the one you've been waiting for! NOT a flip! Light, bright & super charming. Recently updated w/ fresh paint, laminate flooring & new carpet. Upgrades include 2 remodeled baths, modern light fixtures & ceiling fans, wired 4 sound ,dual pane windows & a furnace w/ AC! The remodeled kitchen features granite tops, stainless appliances & a stunning subway tile back splash. Amazing landscaping w/ a private front courtyard & covered backyard patio. Even a full 2 car garage! Beautifully updated home located on a huge corner lot & cul-de-sac. Lots of charm & curb appeal. New carpet, new paint, new stainless appliances, newer windows & shutters. Lovely covered patio that opens up to the pool & landscaped backyard. Light & bright, open, flowing floor plan. Beautiful, low maintenance landscaping! Sparking pool surrounded by paver tiles and flowering planter boxes. Perfect for entertaining inside & out! The seller will entertain offers between $649,900 & $685,000. Hurry to this Clairemont gem located on cul-de-sac! Huge 9,200 square foot pie shaped lot with westerly views! Room to expand existing home! Open floor plan! Living room and dining room combo! Two car attached garage with direct access into home! Master bedroom with bathroom! Quiet location! Family neighborhood! "COUNTRY IN THE CITY" BEAUTIFUL HOME HAS A GOURMET KITCHEN W/CORIAN COUNTER TOPS & S.S STEEL FRIDGE W/HARDWOOD FLOORINGS. LARGE DINING ROOM OVERLOOKING THE BACKYARD W/AMAZING VIEWS OF THE CANYON THAT IS PERFECT FOR ENTERTAINING THOSE SUMMER NIGHTS! OPEN FLOOR PLAN W/VAULTED WOOD CEILINGS, SKYLIGHTS, DUAL PANE, CEILING FANS, GAS FIREPLACE, AUTOMATIC SPRINKLERS AND LAMINATE WOOD FLOORINGS & DESIGNER PAINT THROUGHOUT! LARGE MASTER BEDROOM W/WOOD SHUTTERS & MIRROR WARDROBES W/CANYON VIEWS ALL IN A HUGE LOT! "COUNTRY IN THE CITY" THIS BEAUTIFUL HOME HAS A GOURMET KITCHEN WITH CORIAN COUNTER TOPS AND STAINLESS STEEL FRIDGE WITH PLENTY OF CABINETS FOR STORAGE AND REAL HARDWOOD FLOORINGS. LARGE DINING ROOM OVERLOOKING THE WELCOMING TILED BACKYARD WITH PATIO COVER AND AMAZING VIEWS OF THE CANYON THAT IS PERFECT FOR ENTERTAINING THOSE SUMMER NIGHTS! OPEN FLOORPLAN WITH NATURAL LIGHTING, VAULTED WOOD CEILINGS, SKYLIGHTS, DUAL PANE WINDOWS, A/C, CEILING FANS, GAS FIREPLACE, TILED BATHROOM, AUTOMATIC SPRINKLERS AND LAMINATE WOOD FLOORINGS & DESIGNER PAINT THROUGHOUT! LARGE MASTER BEDROOM WITH WOOD PLANTATION SHUTTERS AND MIRROR WARDROBES WITH CANON VIEWS ALL IN A HUGE LOT! Rancho San Pasqual gated golf course community. Property has plenty of windows that give plenty of natural lighting. Open floor plan with dining and living rooms, newer kitchen appliances, granite and sitting eating area. Golf course fairway view from family room and upstairs master. The two of upstairs bedroom have access to private balcony. Back yard is landscaped with sitting area, fruit trees and grassy area for the kids to play. Could be 3 car garage with one of the spots being tandem parking. Beautiful turn-key home situated in a private cul-de-sac location in South Vista on a coveted corner lot. Enjoy your private home, even on a warm summer day with your newer A/C and perfectly shaded large yard. This home boasts new carpet and paint throughout, a beautifully upgraded kitchen with natural stone counters & stainless steel appliances, and remodeled bathrooms. Choose the floor you want to live on with a dual master design floor plan (1 up and 1 down). (see supplement) With ample side yard and upstairs storage area, there is ample room to expand in this lovely home. Large driveway and side yard also provide plenty of parking for your needs. Experience true convenience with a great location close to shopping and the 78 Freeway. Spacious single level MOVE IN READY *** Open floor plan*** High ceilings***Desirable area and conveniently located near shopping, restaurants, and Stone Brewery***Hidden away on a rural street. *** Large lot with room for organic garden or swimming pool. Potential to build companion unit, check with city *** Beautiful wood floors, upgraded kitchen and bathrooms, expansive patio perfect for entertaining ***3 Car garage, large flat driveway, room for RV *** Cozy fireplace. No HOA or Mello Roos!! Must see this home to appreciate the peaceful feel! Enjoy all of the sunlight streaming in from the abundant windows while listening to the birds singing. Easy living and entertaining with a lovely open floor plan with large living areas flowing into one another and spilling out into the very large patio and gardens. Home is turn key with beautiful wood floors, designer window treatments including plantation shutters, quartz counter tops, Bosch dishwasher, large stainless steel refrigerator with freezer on bottom, upgraded bathrooms, 3 car garage, large driveway with hardscaped side yard that could accommodate an RV or boat, cozy brick fireplace, drought tolerant landscaping, indoor laundry room with sink. abundant storage space, shade trees, and more that is all city close with country feel and NO HOA fees or Mello Roos!! GORGEOUS HOME HAS EVERYTHING YOU ARE LOOKING FOR W/AMAZING FLOOR PLAN & UPGRADES! HUGE GOURMET KITCHEN W/GRANITE COUNTER TOPS & S. S. APPL. & BUILT-IN BOOKSHELVES IN DINING ROOM ALL SURROUNDED BY TRAVERTINE FLOORINGS. 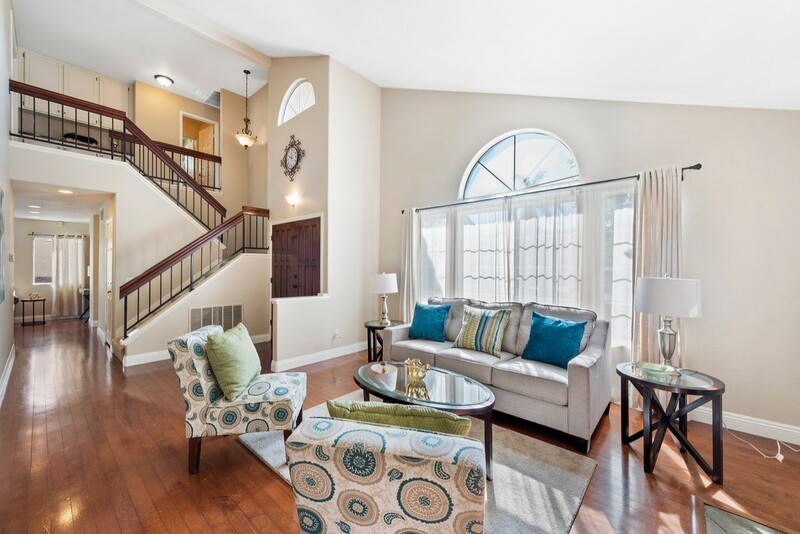 SPACIOUS LIVING ROOM W/HARDWOOD FLOORINGS, FRENCH DOORS & VINYL WINDOWS. GIANT FAMILY ROOM W/GAS FIREPLACE. LARGE MASTER SUITE W/MIRROR CLOSETS. A/C & ELECTRIC SOLAR PANELS. PRIVATE BACKYARD W/PROFESSIONAL LANDSCAPING, LONG DRIVEWAY W/RV PARKING, 2 CAR GARAGE & MORE! SEE SUPPLEMENT BELOW!!! THE GEM OF ESCONDIDO IS NOW FOR SALE! THIS GORGEOUS HOME HAS EVERYTHING YOU ARE LOOKING FOR WITH AMAZING FLOOR PLAN & UPGRADES! HUGE GOURMET KITCHEN WITH GRANITE COUNTER TOPS AND STAINLESS STEEL GAS STOVE, DISHWASHER, MICROWAVE, DEEP SINK, CUSTOM CABINETS WITH PLENTY OF STORAGE SPACE AND BUILT-IN BOOKSHELVES IN DINING ROOM ALL SURROUNDED BY TRAVERTINE FLOORINGS. SPACIOUS LIVING ROOM WITH REAL HARDWOOD FLOORINGS, DOUBLE FRENCH DOORS AND DUAL PANE WINDOWS WITH PLENTY OF NATURAL LIGHTING. GIANT FAMILY ROOM WITH TILED GAS FIREPLACE AND BEAUTIFUL BLINDS & CURTAINS. LARGE MASTER SUITE WITH PLUSH CARPETING, MIRROR CLOSETS AND DOUBLE GRANITE SINKS. ALL BEDROOMS ARE VERY SPACIOUS WITH DESIGNER PAINT THROUGHOUT! NEWER A/C UNIT WITH MONEY SAVING ELECTRIC SOLAR PANELS. PRIVATE BACKYARD SURROUNDED BY PROFESSIONAL LANDSCAPING, AUTO SPRINKLER SYSTEM, LIGHTS & CITRUS TREES THAT IS PERFECT FOR ENTERTAINING! LONG DRIVEWAY WITH RV PARKING AND HUGE 2 CAR GARAGE ALL ON A CUL-DE-SAC! CLOSE TO SCHOOL, SHOPPING MALLS, DINING & EASY FREEWAY ACCESS! THIS IS A MUST SEE!!! 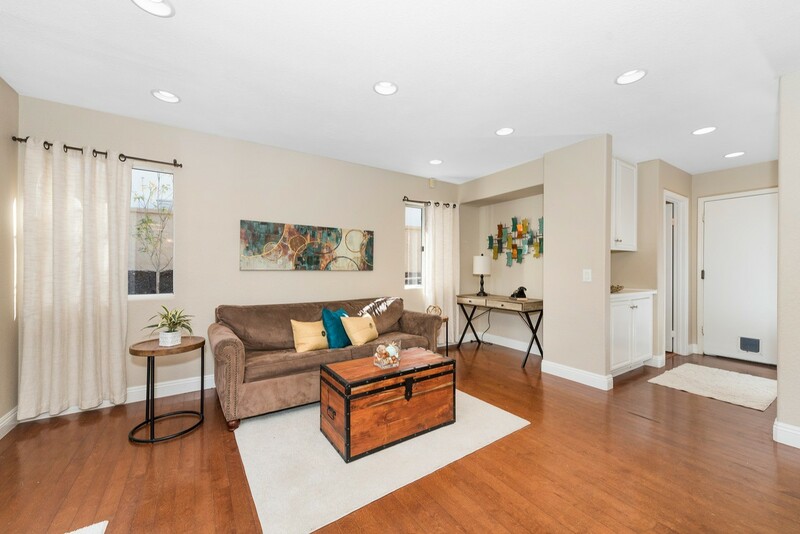 Fully renovated Mira Mesa home. This updated home features new engineered wood laminate flooring & custom tile throughout, new dual pane windows, recessed lighting, fully updated kitchen, & bathrooms. Large kitchen features custom espresso colored shaker cabinetry with plenty of storage, granite countertops, stainless steel appliances. Canyon rim lot with large private yard, perfect for entertaining! Excellent central Mira Mesa location close to freeways, shopping, schools, Miramar, La Jolla & the beach! This home is beautifully renovated and meticulously cared for. This cozy home has a great use of space. Stylish kitchen features shaker style cabinets with espresso colored finish, granite countertops and stainless steal appliances. Nice use of recessed lighting and modern light fixtures. The backyard is great for entertaining and even has some unfinished space that could be finished for additional outdoor living. No neighbors behind! Move-in ready! Recently repainted exterior and interior as well as remodeled with a new kitchen, baths, flooring, windows, patio slider, landscaping, hallway closet, light fixtures and 4 Fujitsu Halcyon high efficiency wall mounted mini-split cooling and heating units for zoned remote-controlled environmental comfort. Light and bright interior thanks to the vaulted ceilings, single-story open floor plan layout and abundant windows. Wonderful neighborhood with great schools and a view of Cowles Mountain. THIS GORGEOUS SINGLE-STORY HOME IS ON A CORNER LOT THAT HAS EVERYTHING YOU ARE LOOKING FOR! HUGE GOURMET GRANITE KITCHEN W/BUILT-IN CUSTOM BENCH W/TONS OF CABINETS & PULL-OUT SHELVES, GAS STOVE. LARGE LIVING ROOM & FORMAL DINING. BIG MASTER RETREAT W/2 CLOSETS & JACUZZI TUB. DUAL PANE WINDOWS, A/C,WATER SOFTENER & DESIGNER PAINT THROUGHOUT! ENORMOUS FAMILY ROOM W/BEAUTIFUL WOOD LAMINATE FLOORINGS THAT LEADS TO A PRIVATE RESORT W/SPARKLING POOL SURROUNDED BY PROFESSIONAL LANDSCAPING! (SEE BELOW) THIS GORGEOUS SINGLE-STORY 3 BEDROOMS & 2 BATH HOME ON A CORNER LOT HAS EVERYTHING YOU ARE LOOKING FOR! HUGE GOURMET GRANITE KITCHEN WITH STAINLESS STEEL SINK AND BUILT-IN CUSTOM BENCH & TABLE WITH PLENTY OF CABINETS FOR STORAGE WITH PULL-OUT SHELVES, GAS STOVE AND NEWER APPLIANCES. LARGE LIVING ROOM AND FORMAL DINING AREA WITH WOODEN SHUTTERS & PLENTY OF NATURAL LIGHTING. BIG MASTER RETREAT WITH 2 CLOSETS & EXTRA STORAGE UNIT AND TILED BATHROOM WITH JACUZZI TUB. THIS HOME HAS DUAL PANE WINDOWS, A/C, WATER SOFTENER & WATER FILTRATION, FANS IN ALL ROOMS, SPACIOUS BEDROOMS, BEAUTIFUL TILED FLOORINGS AND DESIGNER PAINT THROUGHOUT! ENORMOUS FAMILY ROOM WITH BEAUTIFUL WOOD LAMINATE FLOORINGS THAT LEADS TO A PRIVATE RESORT WITH SPARKLING POOL THAT IS SURROUNDED BY PROFESSIONAL LANDSCAPING WITH TROPICAL PALM TREES, CITRUS & FRUIT TREES, MANICURED LAWN, AUTOMATIC SPRINKLER SYSTEM ALL IN A PRIVATE BACKYARD! CLOSE TO SHOPS & RESTAURANTS AND EASY FREEWAY ACCESS! A MUST SEE! Don't miss this beautifully home! The incredible, lush backyard is ready for your enjoyment! Walk out into a spacious sun room into a yard perfect for outdoor entertaining that opens up into a beautiful, green landscaped paradise. There is lovely landscaping in the front & back. New solar is FULLY paid for! Amenities include engineered hard wood floors, beautiful recycled glass counter tops w/gorgeous teal glass back splash and new windows! Upgraded 200 amp electrical system. TRULY UNIQUE TOWNHOME IS PERCHED ON A HILLSIDE W/BREATHTAKING VIEWS! GORGEOUS 3 BEDS & 3.5 BATHS & 2 WALK-IN CLOSETS W/MIRROR DOORS & ONE BEDROOM LOCATED ON 1ST FLOOR! ENORMOUS GOURMET GRANITE KITCHEN W/MATCHING ISLAND & NEWER APPLIANCES W/GAS STOVE, UPGRADED CABINETS & ABUNDANT NATURAL LIGHTING! GORGEOUS HARDWOOD FLOORINGS, CROWN MOLDINGS,SLIDING BARN DOOR, A/C AND DESIGNER PAINT THROUGHOUT! YOU'LL BE AMAZED HOW PRIVATE THIS HOME FEELS WITH AMAZING SUNSETS EVERYDAY! RESORT LIVING! (SEE SUPPLEMENT) WHAT A VIEW! THIS TRULY UNIQUE TOWNHOME IS PERCHED ON A HILLSIDE WITH BREATHTAKING VIEWS IN EVERY ROOM! THIS HOME HAS EVERYTHING YOU ARE LOOKING FOR! GORGEOUS 3 BEDROOMS AND 3.5 BATHS HAS 2 WALK-IN CLOSETS WITH MIRROR DOORS AND ONE BEDROOM LOCATED ON THE 1ST FLOOR! ENORMOUS GOURMET GRANITE KITCHEN WITH MATCHING ISLAND AND NEWER APPLIANCES WITH GAS STOVE, UPGRADED CABINETS WITH TONS OF STORAGE SPACE AND ABUNDANT NATURAL LIGHTING! TASTEFUL INTERIORS WITH GORGEOUS HARDWOOD FLOORINGS, CROWN MOLDINGS, SLIDING BARN DOOR AT LAUNDRY ROOM, A/C, KEYLESS ENRTY AND DESIGNER PAINT THROUGHOUT! YOU'LL BE AMAZED HOW PRIVATE THIS HOME FEELS WITH AMAZING SUNSET VIEWS AND SPACIOUS BALCONY! THE NORTHSTAR COMMUNITY AMENITIES INCLUDE A POOL, CLUBHOUSE AND BBQ AREA IS JUST A STONE’S THROW AWAY FROM YOUR FRONT DOOR. RESORT LIVING AT IT’S BEST! Featured on HGTV House Hunters, this beautifully renovated home has so much to offer. Stylish kitchen equipped with stainless steel appliances. Check out the home theater system with 100 inch screen, projector and surround sound system! Home has room to roam, sitting on just over a ¼ acre, an over-sized two car garage, additional parking spaces, RV parking with Picturesque 180 degree mountain views. Home comes with large Fuerte Avocado tree that has produced a lot of avocados. A/C and Furnace was replaced about 4 years ago, newer energy efficient windows, wainscoting, crown molding, upgraded kitchen and bathrooms. THE GEM OF SMOKE TREE IS NOW FOR SALE! GORGEOUS SINGLE-STORY CORNER UNIT W/GOURMET KITCHEN & BAR AREA, UPGRADED CABINETS, HUGE LIVING ROOM, VAULTED WOOD BEAM CEILINGS, NATURAL LIGHTING, LARGE BRICK GAS FIREPLACE W/AUTO SWITCH, NEW PLUSH CARPETING, ITALIAN TILES, A/C AND DESIGNER PAINT THROUGHOUT! HUGE MASTER SUITE HAS DUAL SINKS, WALK-IN MIRRORED CLOSET W/PRIVATE PATIO. SPACIOUS 2 CAR GARAGE ALL ON A PRIVATE LOCATION. WALKING DISTANCE TO SHOPS, RESTAURANT & EASY FREEWAY ACCESS. RESORT LIVING AT IT'S BEST! THE GEM OF SOUTHBAY - Move-in ready home!! 3 BEDROOMS + BONUS ROOM w/ SEPARATE & PRIVATE ENTRY. Remodeled kitchen w/ granite countertops & stainless steel appliances, wood-look tile flooring, dual-pane windows & shutters throughout. Remodeled master bedroom w/large walk-in closet. You will enjoy entertaining family & friends in your spacious backyard w/ covered patio & fireplace. Located in Southbay near schools, shopping & 805 freeway. BRAND NEW ROOF!!!!! Enjoy the great curb appeal as you pull up to this cozy, single story home in beautiful Escondido, California. This 4 bedroom, 2 bathroom, 1,632 square feet house includes exposed wooden beam ceilings in the living room and master bedroom, creating a warm and inviting atmosphere. The spacious backyard features a brand new fence, a covered patio, and an above ground Jacuzzi spa with brand new pumps and motors, creating a perfect outdoor hideaway. See Supp. This awesome property also includes possible boat and trailer parking and is in a great location, with quick access to the shopping and dining in downtown Escondido, as well as being just minutes away from the 78 freeway. Price Reduction! Amazing bungalow style home in Normal Heights. Completely updated kitchen & bathroom with custom tile. Original hardwood floors & fireplace give the home character. Updated pluming, electrical, dual pane windows & tank-less water heater. Back yard features AstroTurf and pavers, making it a low maintenance area for entertaining. The home also has central air, not common in this area. Excellent location, close to freeways, shopping, restaurants & much more! What an amazing location! Walk to all the amazing restaurants, shops, parks and everything Normal Heights and North Park have to offer! Conveniently located to freeways! Attic with pull down steps provide very accessible storage space. The stack-able washer and dryer allow you to do laundry inside the home, but could be moved back outside if desired. The home once had a garage that could be added back, or you could open up the fence for parking. Plenty of usable outdoor space for table and chairs in the front yard as well! The home features updated plumbing, electric, new dual pane windows, beautiful modern kitchen with excellent use of space, update bathroom, and tank-less water heater, all while keeping the character of a 1920's home. This home also features central air conditioning for those extra warm nights that everyone tries to tell you we don't get in San Diego! For the price of a condo you can own your own home without paying HOA fees! THE GEM OF SMOKETREE! MAGNIFICENT SINGLE-STORY HOME HAS OVER $90K IN UPGRADES! COMPLETELY REMODELED WITH A DESIGNER'S TOUCH. HUGE GOURMET KITCHEN W/UNIQUE & RARE RED DRAGON GRANITE COUNTERTOPS & BAR AREA FROM THAILAND, CUSTOM CABINETS W/LIGHTINGS, NEWER S.S.APPL, A/C,TILE FLOORINGS, VINYL WINDOWS & CUSTOM DRAPERY, BRICK FIREPLACE, ENORMOUS MASTER RETREAT & LARGE TILED BATHROOM. FRENCH DOORS THAT LEADS OUT TO THE PRIVATE PATIO OVERLOOKING THE SAN DIEGO RIVER WITH PEACEFUL SOUNDS OF NATURE! (SEE SUPPLEMENT) THE GEM OF SMOKETREE IS NOW FOR SALE! THIS MAGNIFICENT SINGLE-STORY HOME HAS OVER $90K IN UPGRADES! COMPLETELY REMODELED WITH A DESIGNER'S TOUCH. HUGE GOURMET KITCHEN WITH UNIQUE & RARE RED DRAGON GRANITE COUNTERTOPS & BAR AREA FROM THE RAIN FOREST IN THAILAND, CUSTOM CABINETS WITH LIGHTINGS & PULL OUT SHELVES AND TONS OF STORAGE SPACE, NEWER STAINLESS STEEL APPLIANCES, A/C, RECESSED LIGHTINGS, DESIGNER TILE FLOORINGS, VINYL WINDOWS & CUSTOM DRAPERY, VAULTED CEILINGS, BRICK FIREPLACE, SPACIOUS BEDROOMS, ENORMOUS MASTER SUITE RETREAT WITH 2 SKYLIGHTS AND LARGE TILED BATHROOM & GRANITE DUAL SINKS. BEAUTIFUL FRENCH DOORS THAT LEADS OUT TO THE PRIVATE PATIO OVERLOOKING THE SAN DIEGO RIVER WITH PEACEFUL SOUNDS OF NATURE. THIS COMPLEX IS RESORT LIVING AT IT'S BEST WITH SPARKLING SWIMMING POOLS AND WELL-MAINTAINED GROUNDS. THIS WILL NOT LAST! Gorgeous City and Mountain views! Live and work from this 3 or 4 Bedroom home. Brand new Furnace and A/C unit. Dreaming of having your own home business? Operate a business here with great freeway visibility. Development potential too. Can be sold with the neighboring property at 320 S. Pierce St to construct an office building. See supplement for details on O-P zone uses. Second 2 car garage behind drive thru gar. Lot is zoned office professional (O-P). 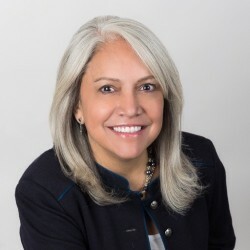 O-P zoning allows many uses such as day care, beauty salons, art studios, florist, medical and dental offices, music lessons, pharmacy, photograpic studio, Attorney and CPA offices, residential care facilities, parking lots, & more. Urban-inspired townhomes in the heart of South San Diego. This home has one bedroom & full bath on first floor. All secondary bedrooms are on second floor. Third floor bonus room, office area, & large patio make for a great escape! Each floor has outdoor living space. This new modern home has granite counter tops, stainless appliances, on demand and tankless water system, numerous energy & water efficiency features & much more. Complex has amazing amenities all close to shopping, restaurants & freeways. This is the very functional floor plan five at Luna. The main entrance & garage are on the first floor along with a bedroom, full bath, kitchen, living space and patio. The second floor features the master bedroom, bathroom and walk-in closet, 2 secondary bedrooms, a bathroom, living area and patio. The third floor boasts a large bonus room, office area & oversize balcony, perfect for entertaining. This home features neutral colors. Being an end unit, the garage entrance is from the street for easy access. Playa Del Sol has spectacular amenities! Enjoy a resort-style pool, exercise room, bbq's, clubhouse, playground and more. All with convenient access to downtown, freeways, schools, military facilities and attractions such as Matressfirm Amphitheater, Aquatica & Los Americanos Outlet Mall. Darling Cozy HOME! UNDER 500k!! Well loved for 50 years! 3 Bedrooms and 2 Bathrooms! 1519 Square Feet! Two front bedrooms separated from the Master Bedroom area which is in the rear of the house. French doors lead out to the garden. Indoor Laundry Room! Garage opens in front and in back! Some updates throughout the home. Large lot! 8,300 sf! Sheds in back yard will convey. Fruit trees! Flowers! ZONED R-2!! Freshly painted rooms, and price reduction! Come see this beautifully located home in Fallbrook with gorgeous views of lake and gate access to hiking trails around it. Great floor plan with views from each room. 3 bedrooms, 2 1/2 baths, and solar panels! Finished garage with built-in storage cabinets. Termite report. Seller willing to give up to 10K credit for flooring. Excellent choice for a VA or USDA loan. Easy access to fwy. Bonsall School District, Low HOA's, NO Mello-Roos! GEM OF SAN DIEGO COUNTRY ESTATES. LARGE GOURMET KITCHEN W/S.S APPL, BAR AREA. HUGE LIVING & DINING ROOM W/GAS FIREPLACE. LARGE BEDROOM ON FIRST FLOOR SURROUNDED BY SPANISH TILES, WOOD FLOORINGS, PLUSH CARPETING, NEW FURNACE & A/C, CENTRAL VACUME & DESIGNER PAINT THROUGHOUT. SPACIOUS MASTER SUITE HAS A BIG WALK-IN. ENJOY PARK-LIKE BACKYARD W/ EVENING BREEZES SURROUNDED BY TREES & DROUGHT TOLERANT SUCCULENTS PLANTS. COUNTRY LIVING W/HORSES ALLOWED ON A HUGE LOT ALL IN A PRIVATE SETTING! (SEE SUPPLEMENT) THE GEM OF SAN DIEGO COUNTRY ESTATES. THIS GORGEOUS 4 BEDROOMS WITH 2.5 BATHS HOME HAS IT ALL! LARGE GOURMET KITCHEN WITH BAR AREA, STAINLESS STEEL APPLIANCES, TONS OF STORAGE AND PLENTY OF COUNTER SPACE AND NATURAL LIGHTING. HUGE LIVING & DINING ROOM WITH TILED GAS FIREPLACE OVERLOOKING THE BEAUTIFUL BACKYARD. LARGE BEDROOM IS LOCATED ON FIRST FLOOR SURROUNDED BY SPANISH TILES, WOOD FLOORINGS, PLUSH CARPETING, NEW FURNACE & A/C, CENTRAL VACUME SYSTEM AND DESIGNER PAINT THROUGHOUT. SPACIOUS MASTER SUITE HAS A BIG WALK-IN CLOSET WITH BUILT-INS, MASTER BATH HAS DUAL SINKS & LARGE BATH TUB WITH DUAL SHOWER HEADS. ENJOY PARK-LIKE BACKYARD WITH EVENING BREEZES SURROUNDED BY TREES & DROUGHT TOLERANT SUCCULENTS PLANTS. HORSES ALLOWED ON ALMOST AN ACRE LOT ALL IN A PRIVATE SETTING. COUNTRY LIVING AT IT’S BEST! SDCEA FEATURES TENNIS COURTS, GOLF, POOL, SPA, HOT TUB, PLAYGROUNDS, RECREATION AREA, HORSE FACILITY & TRAILS, HIKING, BIKING AND RV/BOAT PARKING. You will fall head over heals for this incredible home! Stepping into this immaculately cared for home, you'll notice the elegant design, pristine condition, & true pride of ownership. Stunning hardwood floors flow into a beautiful marble tiled kitchen that boasts of hand crafted cabinetry & gorgeous, hand selected granite counter tops. From the kitchen, overlook the large, private enclosed patio that's perfect for entertaining your guests or relaxing with a glass of wine. Don't miss out on this gem! The beautiful community of North Rim includes a gorgeous pool, hot tub, sauna, clubhouse for private parties, ping pong & pool tables, lit Tennis Courts, BBQ, and more! Minutes from University of San Diego & Tecolote Canyon Natural Park & Nature Center, and the finest shopping in San Diego! Quick access to I-5, I-8, and 163. From the patio, feed the beautiful humming birds who have frequented the flowers and bird feeders here for many years! No HOA or Mello Roos! Amazing House on a secluded cul-de-sac. Backyard has access to green belt open space! Mountain Views! Move in ready! Level fenced in yard. Laminate Wood Flooring. Tenant has given this home love and care for 7 years. All appliances convey (except the dryer- tenant owned). Come see this charmer. Move in ready after January 1st. The last one for sale on the street sold in just 11 days. Charming Move in Ready Home in very desirable neighborhood features:Dual pane windows,kitchen w/granite counters tops & breakfast area,vaulted ceilings, AC, bath w/shower downstairs, Custom Paint, travertine flooring & newer carpet.Enjoy formal DR & LR Room w/cozy fireplace. Master Bedroom: walk-in closet, reading/office area. Master Bath with his/hers sink, tile flooring. Backyard perfect for outdoor entertaining, refreshing pool and spa, Shed for tools and toys, RV parking. Bonus Room main floor.NO HOA! Welcome Home! Situated on a huge lot, you can have it all! Additional Features, newer water heater, laundry room next to garage. Bonus Room in main floor with carpet flooring and portable A/C unit installed in the room, permits unknown. Enjoy family room just next to kitchen that opens to your covered patio and pool! Conveniently located just couple minutes from FWY 15, walking distance to Lake Elsinore High. NO HOA Fees and NO Mello-Roos. Beautiful sweeping city, mountain, and hill views. Bring your VA buyers! 3BR home with good bones. Roof and dual pane windows installed appx 6 years ago. Furnace replaced about 10 years ago. Custom built. Dreaming of having your own home business? Potential to operate a business here with great freeway visibility. See supplement for details on O-P zone uses. City of El Cajon fee for zone reclassification is currently $3,675. O-P zoning allows many uses such as beauty salons, art studios, florists, medical and dental offices, music lessons, pharmacy, photograpic studio, Optometrist offices, optical goods sales, Attorney and CPA's and like businesses. City of El Cajon fee for zone reclassification is currently $3,675. Fixer. All in original condition and needs updating. Family room, second bath, and walk-in closet added many years ago. Seller states some wood floors under carpets but agent has not and will not verify. Buyer is to satisfy self regarding the flooring. Large level lot. Great location with easy access to the 805, 5, and 54 freeways. Extra rooms not included in listed square footage are the enclosed patio, utiity area of the enclosed patio, and room behind the garage used as a laundry room in the past. Rare find in San Marcos! Fantastic Location in the middle of everything: San Marcos Restaurant Row, Shopping, Church, walking distance from Discovery Elementary & San Marcos High. This Twinhome offers the PERFECT setting: End unit, attached to one neighbor, vaulted ceilings, open floor concept, two full baths, cozy fireplace, dual pane windows, 2-car garage, and 3-full size closets in the garage and built in overhead storage area in garage. Master Bath with his/hers sink & tile flooring. THIS IS IT! Be the first to own this 2 bedroom unit! Enjoy additional garage storage, 2 card garage, end unit location close to everything! Affordable home in Fallbrook! This single story home has 3 bedrooms, 2 baths, a generous backyard and 2 car garage. Beautiful front yard is landscaped with drought tolerant plants for a water wise garden. It has a newer AC and Furnace. Close to downtown and yet very peaceful. A wonderful opportunity for someone wanting to call this special house their home! Priced to sell, don't miss this one! Beautiful 2BR/2BA condo located in the highly desirable Rancho Mission Trails. Dual master setup w/BRs on each side of living room for added privacy. Spacious living room w/gas fireplace leads to private balcony. Enjoy central A/C & stacked W/D. Kitchen features granite countertops, refrig, gas range/oven, dishwasher & built-in microwave. 2 parking spaces in gated garage. Community owned solar for reduced energy costs. Well maintained complex provides lush landscaping, pool/spa, BBQ area, clubhouse & gym. Indulge in the serene views from this corner unit condo tucked away behind the gates at the resort like community of Pacific Pines in Encinitas. Top level unit, bursting with charm. Inside you’ll admire the walk-through kitchen with granite counters and separate dining area. The living room is warmed by a cozy fireplace and opens to the covered patio. Bright and airy master bedroom with a walk-in closet and ceiling fan. Enjoy the whole house fan and the convenient in-unit washer and dryer and owned water filtration system. The community offers mature park like landscaping, pool, spa, workout room, two tennis courts and newly installed electric car charging stations. Great location that feels secluded but minutes to the I-5 freeway, Sprouts, Trader Joe’s, and restaurants. RESORT LIVING AT IT’S BEST! LOVELY 2 BEDROOM & 1.25 BATH CONDO W/ PATIO IS LOCATED ON 1ST FLOOR HAS EVERYTHING YOU ARE LOOKING! OPEN KITCHEN W/PLENTY OF CABINETS, LARGE LIVING & DINING AREA AND HUGE MASTER BEDROOM W/WALK-IN CLOSET! NEW WOOD LAMINATE FLOORINGS, TILES, DUAL PANE WINDOWS, A/C AND DESIGNER PAINT THROUGHOUT! CLOSE TO LAUNDRY ROOM & PARKING SPACE IS IN FRONT OF UNIT. AMENITIES INCLUDE SWIMMING POOLS,CLUBHOUSE,TENNIS COURTS & GYM. PET FRIENDLY! CLOSE TO TROLLEY & SHOPS! (SEE SUPPLEMENT BELOW) RESORT LIVING AT IT’S BEST! THIS LOVELY 2 BEDROOM AND 1 BATH CONDO IS LOCATED ON THE FIRST FLOOR WHICH HAS EVERYTHING YOU ARE LOOKING FOR WITH OPEN KITCHEN WITH PLENTY OF CABINET SPACE FOR STORAGE, LARGE LIVING & DINING AREA AND HUGE MASTER BEDROOM WITH WALK-IN CLOSET! NEW WOOD LAMINATE FLOORINGS, TILES, DUAL PANE WINDOWS, A/C AND DESIGNER PAINT THROUGHOUT! CLOSE TO LAUNDRY ROOM & MAILBOX AREA AND 1 ASSIGNED PARKING SPACE IS IN FRONT OF UNIT AND 1 GUEST PERMIT. THIS GREAT COMMUNITY AMENITIES INCLUDE SWIMMING POOLS, AWESOME CLUBHOUSE, TENNIS COURTS & FITNESS ROOM AND IS PET FRIENDLY THAT ALLOWS 2 PETS OF EACH 35 LBS. OR LESS AND THIS IS VA & FHA APPROVED COMPLEX. CLOSE TO EVERYTHING SAN DIEGO HAS TO OFFER AND WALKING DISTANCE TO THE TROLLEY, STADIUM, SHOPS AND EASY FREEWAY ACCESS! Completely updated condo in highly sought after Lake Park community! This end unit even has a fireplace. Totally updated with new kitchen, flooring and bathrooms. Live in a resort like setting with ponds, waterfalls and just steps from Lake Murray. This complex has numerous amenities; tennis, volleyball, basketball & tennis courts, 5 heated pools, car wash, lawn game areas, recreation center with exercise equipment. Highly desired studio unit in The Venetian. This updated 1st floor condo located in University City. Gorgeous updated kitchen w/Stainless steel appliances and granite counters. Updated bathroom with glass shower. and granite sink. Large mirrored closest. In unit stacked washer/dryer. Nice size patio for dining. 1 assigned parking space #146. Close to UCSD, Shopping, parks and freeways. Complex has great amenities including pool, spa, fitness center, and club house. Low HOA. Great investment opportunity! Completely upgraded 1st floor condo in gated complex with assigned parking. This unit has so much to offer and won't disappoint! - including brand new laminate wood flooring throughout, brand new dual pane vinyl windows, air conditioning, dual closets in master bedroom, ceiling fans, and a completely upgraded bathroom and kitchen. The open concept kitchen features soft close wood cabinets, a high bar with ample seating options, premium quartz countertops, stainless steel appliances (see supplement) recessed dimmable lighting, subway tile backsplash, and modern matte black finishes. Located between University Heights and Normal Heights, this fully gated complex with lush landscaping is just blocks from Adams Ave and downtown North Park. Walk to some of the best coffee shops, breweries, bars and restaurants San Diego has to offer! Turnkey One Level Condo in Highly Sought after Creekside Community. Fully remodeled home features: Updated Kitchen, granite counters, gorgeous cabinets, engineered floors throughout the home, recessed lighting, convenient inside laundry, and all appliances stay! Tile flooring in bath. One car garage. Private balcony off living room & master bedroom to enjoy your morning cup of coffee and start your day. Cozy fireplace. NO STAIRS! All you are looking for is here! Just couple blocks away from 15 FWY. Your Search is Over! No Stairs to get into the unit, location is ideal, away from freeway. Original furnace was replace only 4 years ago! This unit is clean and move in ready, just bring your suit case! Easy access to 15 freeway and public transportation, walking distance to Miramar College, minutes from restaurants, shopping, movies, Home Depot, Smart & Final, Miramar Lake, etc. All appliances stay! THE GEM OF ALLURE! THIS BEAUTIFUL & SPACIOUS ONE BEDROOM CONDO HAS GORGEOUS GRANITE COUNTER TOPS IN KITCHEN & BATHROOM WITH UPGRADED CABINETS, STAINLESS FRIDGE, BRAND-NEW PLUSH CARPETING, DUAL PANE WINDOWS, DESIGNER PAINT, VAULTED CEILING AND A PRIVATE TILED BALCONY WITH RETRACTABLE SHADE. AMENTIES OFFER 2 POOLS, SPA, LAUNDRY ROOM, EXERCISE ROOM AND CLUB HOUSE. PRIVATE LOCATION AND PERFECT FOR FIRST TIME HOME BUYERS. CENTRALLY LOCATED NEAR PARKS, SHOPPING & EASY FREEWAY ACCESS. RESORT LIVING AT IT'S BEST! BETTER THAN A MODEL! Must See! 1-B, End Unit condominium centrally located in Chula Vista community. Move in ready unit features: Custom paint, laminate flooring, new screen door, new fans, clean and bright! Well-kept grounds, complex offers: pool, laundry facilities, BBQ area and Club house/rec room. One assigned parking spot. Easy access to public transportation, walking distance to gym, restaurants and shopping! Excellent for first time home buyers or investment property. Come see us, this one will go soon!! One parking space assigned, but You can rent an extra one for a onetime payment contract of $50.00 and then $35.00 a month, but there is a waiting list. Please verify information as rules may change. Beautiful highly remodel desirable and rarely available gated community of River Scene is located in hart of Mission Valley district nestled along the San Diego River, the River Scene complex promises the best SD has to offer. This spacious two-bedroom two bathroom with fireplace open-concept condo is located on second floor and offers a unique split floor plan. This gated condo community features a resort-style pool, spa and a full gym, short distant to Mission Valley Mall more. Per CC&R's, no dogs allowed.